Cat Health Care includes seasonal protection for your felines. White cats, or even cats who have dark fur in other places, but who have white ears and/or faces, are especially susceptible to sunburn. 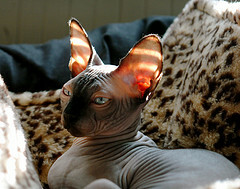 Pale or bald cats (such as the lighter tabby cats and the Sphinx) are also at risk. These cats are known as "sun sensitive" cats. When a sun sensitive cat stays in the sun too long, the tips of their ears nose and even extremities can become sunburned. Why? Well, bald and pale colored cats lack protective pigment in their skin. Being a cat lover, you may already know this. But hopefully the following information may be of interest or use to you. How Can a Cat Get Sunburned? Sunburn is also known as "Solar Dermatitis" when referring to cat health care. But just like sunburn on humans, it is a red and painful burn. It can cause a lot of pain and discomfort. However, that's just the beginning. Too much sun exposure can also make any existing skin problems your cat may have (like dry skin), worse. Overexposure to the sun can lead to a serious medical condition called Squamous Cell Carcinoma. 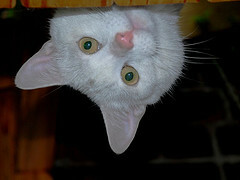 This type of cancer, which usually affects the ears and the nose of white, bald or light colored cats, can be fatal. If you don't prevent sunburn on your white cat, you are likely to have to choose between either surgery to remove the cancerous cells, or chemotherapy. Both of those choices involve a costly series of cat health care visits, and will cost MANY TIMES MORE than a simple vet visit for advice and prevention. Visit the MyCatSite.com Pet Supplies Store! The top layer of a white cat's skin is burned by overexposure to the sun. The skin is pink or red in appearance. The burn is deeper in that it not only affects the top layer of skin, but also a layer or skin more. The sunburned skin is red in color and there may be blisters. All of these are reasons to call or go see your veterinarian immediately. Your vet can help treat the sunburn, and also ease your poor cat's pain and discomfort. Cat Lady says yet again. . . "Never give your cat any medication intended for human use without advice from a cat health care professional!" Cats are very smart creatures. They can tell when they are feeling too hot, and they know to move to a cool, shady area out of the scorching sun. But feeling too hot is not the issue you are fighting. Getting too much UV exposure is. This is where you as the responsible pet owner do your part. 2) To prevent sunburn on your cat, limit her times in the outdoors on sunny days. The sun's ultraviolet (UV) rays are the strongest between ten o'clock in the morning and four o'clock in the afternoon. 3) It is VERY IMPORTANT that you keep your cat indoors during the sunniest part of the day. If your cat MUST go outside, it is important that you apply sun-block to the tips of your cat's ears. Personally, I feel that all cats (no matter what breed or color) should be kept INDOORS. The outside dangers are just too great. 4) If you don't already have one, it would be a good idea to get a litter box (a large plastic storage bin from your local "Super Store" is fine and very inexpensive) and set it up indoors. That way being kept inside during the day won't cost you a carpet. Plus, you could eventually transition her to be an indoor only cat, which would basically DOUBLE her lifespan. 5) If it's common for your cat to sunny spots to lie in, even when indoors, go through your house and close the drapes,blinds, etc, or close the doors to these areas. Also, you can buy some easily applied removable UV filter window film at your local "home improvement type depot". This allows the cat to sit right in the window if desired and not get burned. It also keeps your home cooler and provides a good deal of privacy. They even make a kit with just the right amount for sliding glass doors. 6) Sunscreen For Cats. There are several sunscreen products that are applied to the ears and the nose of white and otherwise sun sensitive cats, which can help relieve their pain, sooth their skin and can really help prevent sunburn. But it needs to be a sunscreen that's made for the cat health care industry. Your vet can help advise you on what is best for your cat's health care needs. This is important because the feline sunscreen won't hurt your cat if she swallows any while grooming. Products meant for humans and not cat health care can contain harmful or even toxic ingredients for cats.